Routine dental care can present an issue to the senior population, as they’re more vulnerable to oral health risks, not only because of their age, but because of different lifestyle issues. Since we only receive one pair of permanent teeth, it’s crucial to care for them at every stage in life. The Washington Dental Service Foundation has found that people over the age of 60 only have a portion of their original teeth left. And, as we age, our risk factors for heart disease and diabetes increases, which also increases the risk of poor oral hygiene. It is crucial for the senior population to schedule routine dental exams for healthy teeth. Why are seniors more at risk? What health concerns contribute to the risk? Heart disease – Studies have found the connection between gum disease and heart disease, so creating optimal oral health habits is greatly impactful to seniors. Good oral hygiene will help guard against strokes, heart attacks, and other heart conditions. Another study has found that oral health conditions are a great predictor for heart disease and high cholesterol levels. Diabetes – When people present with severe gum disease — perodontitis — this makes them more susceptible to diabetes because it actually hinders the body’s ability to use insulin properly. In maintaining balanced blood sugar levels and proper oral care, you may be able to prevent this condition. Pneumonia – Help combat pneumonia, just by brushing your teeth. Pneumonia is a serious condition for seniors and can lead them to amass many health complications and even death. When seniors breathe bacterial droplets in from the mouth to the lungs, it makes them prone to pneumonia; brushing is a good, effortless option to combat this ailment. 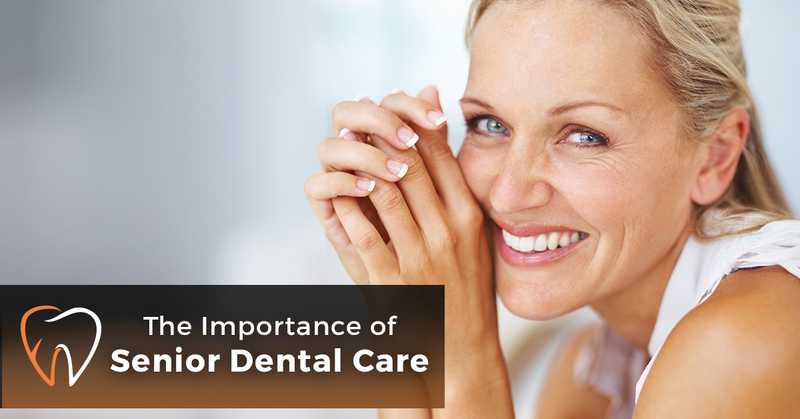 The same recommendations for oral care apply to seniors, but with the increased risk factors it is important for seniors to be extra diligent. Floss your teeth — REGULARLY! Conditions such as arthritis can make brushing teeth increasingly difficult, so consult with us — Enamel Dental — on tips and techniques to use to ensure you’re still able to brush. Sometimes an electric toothbrush or Waterpik can take the strain of joints and allow for a more comfortable brush. If you’re a senior and you’re still smoking — stop! Smoking causes dry mouth and also increases the risk of developing gum disease up to four times. Prevent oral complications by eating a proper diet, with minimal sugar consumption. Remember if you’re prone to dry mouth to stay hydrated! Bacteria can flourish in a dry mouth and cause oral complications. If you’re able to consult with your physician and get off any meds you’re on, this will be beneficial in the prevention of dry mouth and cavities. If you’re concerned about your oral care and need assistance, please call and schedule an appointment with us today. We believe dental care should be available to the senior demographic and strive to work with and for that population.